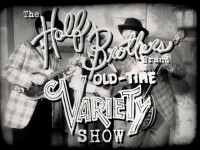 Three promo videos for the Annex Theatre late-night show starring Seattle-based crabgrass band The Half Brothers. Paul and Ben cover Beck. Paul and Ben are forced by the devil to cover the Smashing Pumpkins. Paul and Ben pay tribute to the Bowie. Paul and Ben cover Tom Waits. Paul and Ben cover Cyndi Lauper.